Near the end of 2007, prominent economists began advising the federal government that the economy was heading into a recession. They also mistakenly advised that the recession could be avoided if the government were able to implement some kind of economic stimulus program. In order to work successfully, such a stimulus needed to be large, targeted, and timely. Tax refund checks needed to reach taxpayers in a matter of weeks not months. Economists must have forgotten that they were dealing with the federal government. Recessions are a normal part of the business cycle. The U.S. has averaged a recession about once every five years since WWII. Although economists have gotten better at predicting business cycles, it’s fairly clear that no one has ever been able to sidestep a recession. Avoiding a recession is like trying to stop an oncoming hurricane, when you see it coming you get out of the way, wait for the storm to subside, and then focus on recovery. An economic stimulus package was proposed in January of 2008, in order to avert the recession. Although a similar stimulus plan had been attempted in 2001, and failed to prevent a recession, Congress was compelled to it try again. By the time the checks reached taxpayers, in April of 2008, it was too late, the recession had commenced. In February of 2009 President Obama enacted a second stimulus plan. What was that about? Was he trying to prevent something that had already occurred? The Obama stimulus plan occurred more than a year after it was originally called for. 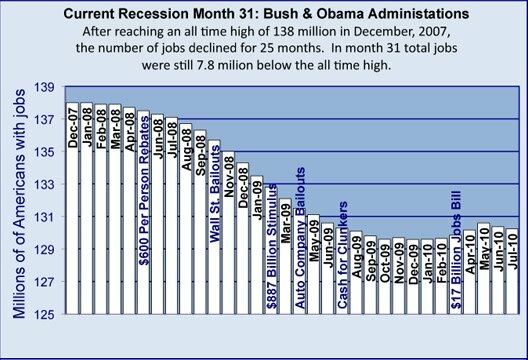 By the time Congress passed Obama’s stimulus plan, the economy was well in the midst of recession. The only purpose of an economic stimulus is to avert a recession. Once an economy is in recession, a whole new set of policies is required. As of this month, around nineteen months after Obama’s first failed stimulus program, and nearly 2 1/2 years after Bush’s tardy attempt, Obama is still talking about a stimulus plan. Isn’t this just economic flimflam? It should be obvious by now that stimulus programs don’t work in the real world. 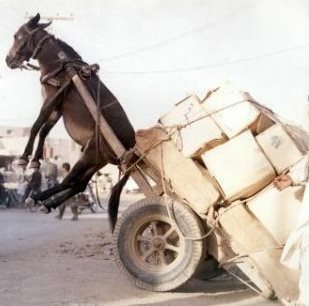 Although the classroom theory is plausible, the federal government is not an efficient vehicle for carrying one out. What should also be obvious is the type of recovery policies that work, once a recession has occurred. 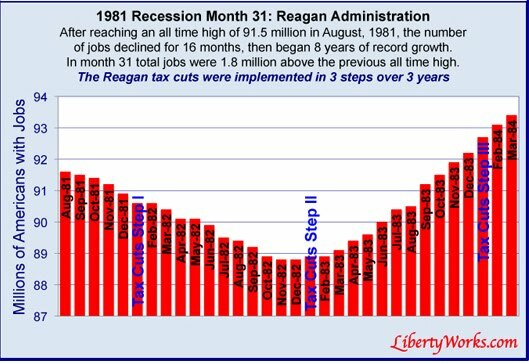 The 2003 Bush Tax Cuts and the 1983 Reagan Tax Cuts were effective tools in creating economic expansions following severe recessions. If the goal is to grow the economy, create jobs, and increase tax revenues, then tax cuts are the way to go. However, if the goal is to flush trillions of borrowed dollars down the drain by attempting something that’s untimely and proven to fail, then maybe that’s Obama’s fate. Obama’s first stimulus plan was untimely and proven to fail, a kind of Flimflam Economics. And even today, he is talking about another economic stimulus program. Again, is Obama trying to prevent something which has already occurred? Does Obama really have the best interests of America at heart? In a January 20, 2008 Dow Jones News article entitled, “The Need for Speed”, it was stated that, “A plan out of Washington to stimulate the flagging US economy may be a day late, but it certainly isn’t a dollar short.” Two days earlier, President George W. Bush called for fast tax relief for individuals and tax incentives for businesses that would total up to $150 billion. Economists said that would be enough of a jolt to have a notable impact on growth, if done right and quickly. Bush said the tax relief for consumers could be a “shot in the arm to keep a fundamentally strong economy healthy.” Bush’s rough draft proposal highlighted the US economy’s big problem: the consumer. “Americans could use this money as they see fit: to help meet their monthly bills, cover higher costs at the gas pump or pay for other basic necessities,” the president said. The need for speed in such a plan is no doubt important, as Bernanke pointed out Thursday. If Congress dilly-dallies on the matter, rebate checks may not arrive to consumers in time to fortify the weak economic growth that is likely to continue throughout 2008. Later, an April 28, 2008 report on CNN Money summed it up, in an article entitled, “U.S. can’t avoid recession, says influential forecaster”. Tax rebates had started to arrive in bank accounts. But many economists we’re doubtful that they would keep the economy from recession. The stimulus package was to give rebates to about 130 million Americans, at a cost of more than $110 billion. Married taxpayers earning $150,000 or less were to receive up to $1,200, while single taxpayers earning under $75,000 would get up to $600. But it was too late. Months later appeared a November 22, 2008 article by NPR entitled, “Obama Offers Plan to Revive Economy“. The author lead with, “President-elect Barack Obama set out plans for an ambitious economic stimulus that would create 2.5 million jobs by January 2011”. “We’ll put people back to work rebuilding our crumbling roads and bridges, modernizing schools that are failing our children, and building wind farms and solar panels, fuel-efficient cars and the alternative energy technologies that can free us from our dependence on foreign oil and keep our economy competitive in the years ahead,” he said. In the same November 22, 2008 NPR article, business and economics historian John Steele Gordon stated that, “the New Deal didn’t end the Great Depression, World War II did.” He added that “building bridges and painting schools won’t provide a quick fix.” He was right. The Great Depression lasted from 1929 until 1945, or around 15 years, and it didn’t end through the action of any clever government policy. 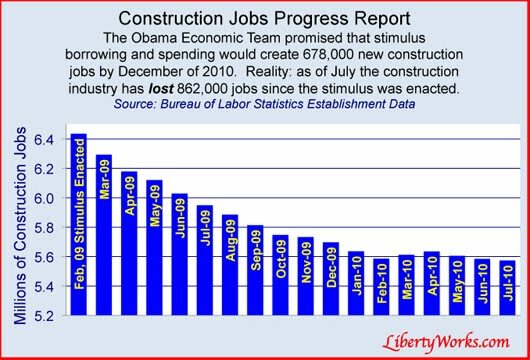 According to Liberty Works, the Obama Economic Team promised that stimulus borrowing and spending would create 678,000 new construction jobs by December of 2010. However, by July of 2010, the construction industry had actually lost 862,000 jobs. During the 2001 economic recession, the government attempted an economic stimulus in the form of tax rebates (similar to the 2008 rebates), but it likewise failed. Then finally in May of 2003, the Bush tax cuts were enacted. The tax cuts were responsible for the creation of 7.3 million new jobs beginning in August of 2003 and lasting through the end of 2007. Tax cuts are the only proven method for bringing an economy out of recession. The deeper the tax cut, the greater the expansion. As the website Liberty Works so aptly reminds us, “President Obama and the Democratic Congress have implemented a series of measures that defy the lessons of past recessions”, especially that of 1981, which was by some measures worse than this one. If the goal is to grow the economy, create jobs, and increase tax revenues, then tax cuts are the way to go. However, if the goal is something more sinister, then one must brainwash their constituents into believing that ‘tax cuts cause recessions’. The Bush tax cuts brought us through another successful business cycle. Then the housing bubble burst, credit markets froze, and we fell back into recession. But tax cuts didn’t cause the recession. I don’t mind cutting Bush to pieces where warranted, and I was doing just that in 2007/08, but to say that the Bush tax cuts didn’t work because you disagree with his foreign policy is ignorant. Whether or not the recession could have been avoided is highly doubtful due to the severity of the housing bubble and credit crisis. Yet if you listen closely, a year ago Obama was saying the recession was caused by the ‘lack of affordable health insurance’, and today he’s saying that it was caused by the ‘Bush tax cuts’. I suppose next he’ll be saying the recession was caused by whatever supports the legislation du jour. Congress needs to cut spending, and cut taxes, now. If you’re not part of the solution, you’re part of the problem. You should have a “hate” option for reactions. Your statement “If the goal is to grow the economy, create jobs, and increase tax revenues, then tax cuts are the way to go” makes zero sense. Think about it: if taxes are cut, revenues…increase? Only if you are under the delusion of trickle down economics being true, which it was found out NOT to be in…oh, when was that? …that's right, the REAGAN administration. I pity the people who follow your blog and believe your lies. I read it just for shits and giggles since it is so full of fallacy. YOU are part of what is wrong with America. The blind leading the blind, or the poor following the rich who persuade them to believe what they tell them so the rich can benefit. If something is too good to be true (less taxes = more revenues! ), it PROBABLY IS. Katie – Thanks for not clicking on a single one of the links embedded in my post. Most of what I wrote were direct quotes from the economists who recommended the first stimulus package passed by Bush, and who actually invented the idea. My critique is not only of the way it was carried out, but that such a program as they described, could ever be successfully carried out by a government run by either party. I can only suggest that you click on the links and follow the chronology as I did. I was actually following all of it in real-time as it happened. Nothing in this post is a lie. Any one who concurs with what I wrote must be one who either lived through and followed along with the events as they occurred, or is likely an economist. To a novist, I'm pretty sure none of what I wrote would make any sense at all. Anyway, thanks for your critique of my critique, but nothing you have said has changed my mind about anything I wrote. I appreciate your passion, but I also realize that passion without logic and credibility is for naught.